What if you could proactively reach out to customers and provide them with a means to complete a financial transaction with your company? I’m not talking about a link in an email but an actual transaction form on their smartphone or other mobile device sent via SMS message. The customer would simply enter their credit card data and hit submit. What value would that bring to your organization? Let’s look at three ways you could use such functionality. The first and most obvious is to reduce shopping cart abandonment rates. Shopping cart abandonment occurs when shoppers put items in an online shopping cart but leave the site before completing the purchase. Baymard Institute found that the average shopping cart abandonment rate is 68.53%. I think we can both agree that that’s a pretty hefty number. The good news is, this number can easily be reduced. Business Insider reports that three-fourths of shoppers who have abandoned shopping carts say they plan to return at a later time to complete the purchase. That means an abandoned shopping cart doesn’t necessarily equate with a lost sale. What’s more, retailers can reduce abandonment rates by retargeting shoppers and streamlining the checkout process. Shoppers may not necessarily check their email soon after abandoning their cart, but they will very likely be near their mobile device. With a PCI-compliant microsite, you can ensure that customers get your reminder to finish their transaction – and provide an easy means to do so. Simply send customers a transaction form that reflects the contents of their shopping cart, and they can complete their purchase on the spot. Companies – and their customers – are increasingly recognizing the value of taking pre-orders for soon-to-be-released products. Buyers don’t have to risk an eagerly awaited item selling out, and companies can gauge demand and more accurately determine initial production runs. But taking pre-orders can be risky. If your company holds credit card funds for the purchase of an item that will take place in the future, you run the risk of the credit card being rejected when it comes time to finalize the transaction. Perhaps the credit card expires, or the card is reissued and the one you have on file is no longer valid. In this case, you can proactively send customers a transaction form that prompts them to update the necessary credit card information. You don’t risk sending an email that may get caught in a spam filter or be completely ignored, nor do you dedicate valuable resources to calling individual customers. Instead, you provide an easy, no-hassle way for the customer to update his/her data and ensure that they receive their pre-ordered item – a win/win for both of you. You could also ask customers to update shipment details, add gift wrapping, or any number of personal touches that add value from the customer’s point of view! It’s pretty amazing the things you can buy via subscription these days. From razor blades to fresh food to dog toys, a variety of products are available via subscription service, saving the customer time (and, oftentimes, money), and ensuring the company a steady stream of revenue. But what happens when that subscription needs to be renewed or, as in the example above, the customer’s credit card is declined because it’s no longer valid? Many times customers want to continue to receive the products they sign up for, but they may not notice their subscription wasn’t renewed until a product runs out and a replacement doesn’t show up in their mailbox. At that point the customer has to be enticed to come back. Companies can avoid gaps in subscription services – and dips in revenue – by proactively pushing transaction forms to customers to renew and/or update their payment information. Very often this will be viewed as a customer service since it’s convenient and easy – which is exactly what a subscription service should be. Finally, because the PCI-compliant microsite runs outside of your company’s data center, and customers’ sensitive financial data is never touched by your people or your systems, the microsite eliminates the need to comply with the PCI Data Security Standard. Both your customers and your company can rest assured that payments are securely transmitted, reducing the risk of fraud and compliance violations. 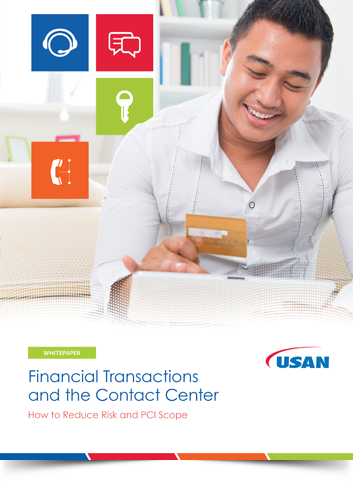 Download the white paper “Financial Transactions and the Contact Center” to learn how to reduce Risk and PCI scope in your contact center.